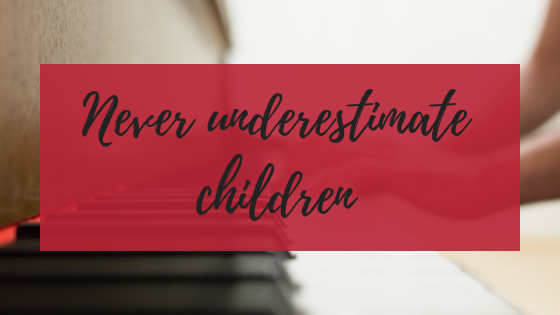 It’s one of my most fundamental beliefs: never underestimate children. You’d be amazed what children are capable of when they’re given half a chance. And then explaining it again. And again. But after a while, something amazing happens. Something clicks. Suddenly, reading the notes isn’t a hindrance or a hurdle anymore. It becomes a tool. A tool to access new music. And that curiosity is the beginning of coming into their own as an artist. It’s the beginning of self-motivation. It’s the beginning of them seeing their own potential. I was in a great children’s choir as a kid. And a couple years ago, I went to their alumni weekend. We learned a concert’s worth of music on a Saturday and then performed it on a Sunday. Learning that much music that quickly involved doing things like sight reading 7-part harmony in Latin. Singing through a new piece only 3 times before being asked to put down the music and sing it from memory. Yikes. We could do it as adults because we learned the skill as kids. In fact, we used to do that kind of thing all the time in choir. Kids are capable of so much. They will rise to the occasion, when the adults in their lives believe in their competence. And the process of learning doesn’t have to be soul-draining, energy-sucking, forced learning with the kids grumbling every step of the way. We loved choir. It was fun! I bet you have something like that in your history too. What amazing thing did you do as a kid, that you’ve forgotten about? Spelling bee champion? Chess expert? Your band won state? You went to swim practice twice a day for years and survived it? And then take a deep breath, and realize that your children are going to have these stories too, when they’re all grown up. They are incredibly capable too. They are going to learn a skill that’s going to just astound you. Are you smiling right now, thinking about it? Me too.